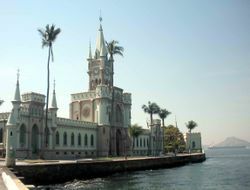 Rio's Centro (Downtown) has most of the city's notable churches and museums, including the Modern Art Museum, as well as many of its most famous bars. Lapa is one of the most thrilling places to be in Rio after dark, with streets and bars full of people, all in historical buildings (most of them from the early 1800s). 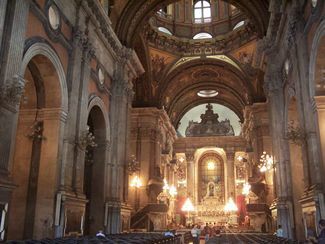 In Lapa you can hear typical Brazilian music such as samba, forró, and choro. It's the place to try typical Brazilian food and drinks like the world famous caipirinha. The nearby Santa Teresa neighborhood, located on the hills to the southwest, is a beautiful historical district and home to many of the city's artists. Line 1 of the subway provides access from both the Zona Sul and the Tijuca area of the Zona Norte. The station at Central do Brasil is the transfer point for Line 2 which services most of the Zona Norte. You can walk to Santa Teresa from surrounding districts such as Catete, though it's a stiff uphill climb, and some of the streets aren't entirely safe. Cinelândia - for Praça XV, the National Library, City Hall, Municipal Theatre, Museum of Modern Art and Odeon movie theatre. To Lapa (Bohemian district). Estácio - used to be for subway Line 2, but it's no longer used for transfers, so, be sure not to come all the way to this station instead of switching trains at Central. In the end of 2011 with Bike Rio  a rental service with 600 bicycles at about 60 stations was launched. A monthly ticket costs R$10 and the 24 hour ticket $R5, where trips up to 60 min are for free. Every further hour costs $R5. Music shops are concentrated on Rua Carioca. While a handcrafted guitar will easily go for thousands of reais, you may want to pick up an inexpensive cavaquinho or cuica. One block north on Rua 7 de Setembro there are some CD and record shops, though their offerings are meager. Avoid entering or leaving Santa Teresa on foot after nightfall. During the day it's a nice hike up the streets, but the neighborhood is surrounded by three different favelas, and assaults after dark are not unheard of even for the locals. Take taxis and stay in groups. This page was last edited on 11 July 2015, at 00:59.